Time is money. Trust us, we’re lawyers and we know what we are talking about. So when clients ask us “How long it will take to fight a traffic ticket in court?” the answer is . . . it depends. 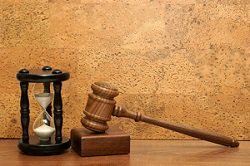 There are a number of factors that can determine how long a person will be forced to sit and wait in traffic court, but there are things you can do to save time. But please note, there really is only one way to save both time and money in traffic court. Fighting a traffic ticket in court is not exactly a user friendly experience. Interminably long court sessions – most of which are spent waiting for a judge to call your name – are only the tip of the iceberg. Before you even get to that point, there’s a whole host of things that must be done. Before you get to court, you must make a decision to fight your ticket. As we’ve discussed many times, you have three options when you get a ticket. 1. Pay the ticket, take the points. 2. Pay the ticket, elect to go to traffic school, if applicable. 3. Fight the ticket. The first option is the fastest way to get the ticket out of your life, but it’s often the most expensive. Paying the full fine and accepting the points and likely insurance hike is the equivalent of throwing in the towel before the fight has even begun. The second option is almost as bad. You pay the fine, but have to devote more of your precious time (and money) to traffic school. It’s like a double whammy: an out-of-pocket expense for the fine and school, as well as the inconvenience and expense of lost time while attending traffic school. The third option, fighting the ticket, is always best. But, if you go ahead and decide to fight the ticket yourself, then get ready to invest a massive amount of time between researching the ticket, determining your defense and attending what will be multiple court hearings. Not sure that’s saving you a lot of time. However, I’m here to help. When you decide to fight a ticket, you can choose to fight it yourself or with an attorney. Without trying to be too self serving, I honestly feel, with few exceptions which we’ll discuss, fighting it yourself doesn’t really save anyone both time and money. Here’s why. Handling it yourself invloves notifying the court you will be contesting the ticket. This takes time, usually in the form of going to the clerk’s office. Then you must attend the next stage which is the Pre-trial conference. Unless you inherently know the statutes and rules of traffic court in Florida (which would take a lot of time to learn), you will not be able to get your case dismissed at this stage. The officer’s are not present and no testimony is allowed, therefore, the only way to get the case dismissed here is through legal motions based on the ticket and NOT based on the facts. Almost all people who choose to fight a ticket themselves end up frustratingly either resolving their matter here (without a dismissal) or setting their matter for trial and obligating themselves to come back to court for their trial. All of this assumes the officer doesn’t request a continuance which would obligate you to come back an additional time. But assuming that doesn’t happen, you’ve already wasted hours of time which almost always equates to money. This is why hiring a traffic attorney frees you from having to be bothered by any of the above. About the only time choosing to go through this ordeal on your own saves you time and money is when the officer notifies the court that there was a problem with the citation and he/she will be unable to proceed. Or the unlikely scenario that your ticket can become lost in the system and you won’t have to appear in court. In that instance, you will receive something in the mail notifying you that the case will be dismissed. One of the best things about hiring a traffic ticket attorney to fight a ticket for you, is that you are taking direct action to resolve your ticket in the best and fastest way possible. That’s part of what you are paying for when you hire a traffic ticket attorney: the attorney’s time, as well as the attorney’s expertise. However, speed shouldn’t be the main selling point when considering how you want your case handled. Merely resolving your matter quickly isn’t always what’s best. In fact, in many cases, it’s not. Most often, only by insisting that the matter go all the way to trial, can an attorney get the best result. Too often, we see attorneys taking the quick and easy way out and resolving matters at the pre-trial stage. The important thing to point out is that when an attorney notifies the court that the ticket is being contested, you, the defendant is not harmed in any way by the delay. In fact, in most cases, you can only be helped if the matter takes longer. Your fee is the same no matter how long it takes and since the attorney is handling it, you do not have to be bothered even thinking about it. The best part is that with an experienced traffic ticket attorney, you will have someone fighting every step of the way instead of having to concern yourself with the specifics and taking up your valuable time. And you don’t have to be an attorney to know, time is money. Feel free to call Unger & Kowitt at 866-374-8355 for a FREE consultation and start saving your valuable time today. To save even more time and money, download our smartphone app and save $5.